A popular snack typical of the Campania region, this pack of “Corno di Capra” Sweet Snacking Peppers is from artisan Michele Ferrante. These peppers are some of the most popular pepper varieties in the world. 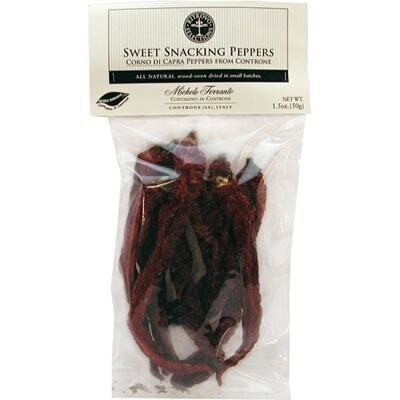 In Campania, however, they are made into these sweet spicy snacks that are as yummily addictive as potato chips. Typically, you sauté these peppers in olive oil, and add a dash of salt to taste. Munch on them as you watch television or as you relax after a hard day at work. You can also crush them over your favorite sauce to give your pasta dish some kick. Or if you prefer, add them to just about any dish you like to make them interestingly spicy. Spice up your life and get a bag of these yummy peppers today!